Welcome to Day #25 of Chocolate, Fruit and Botanicals Month. Peppers are a fruit too. 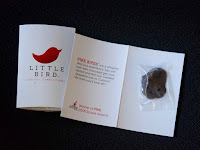 Today's sample size Dark Chocolate Fire Bite from Little Bird Curious Confections (Plainview, NY) contained hot jalapeno pepper pieces. Little Bird founders Corey and Sara Meyer know a thing or two about hot peppers. Their products regularly attain breath-takingly high scores on the Scoville Scale (designed to measure spicy hot foods). 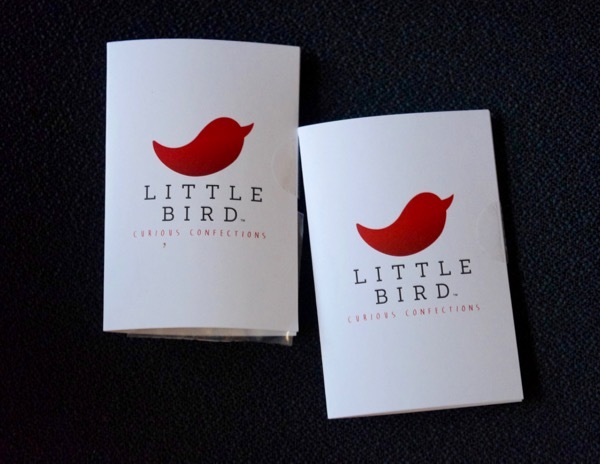 This was a fun chocolate to try. The heat from the first small bite of this Fire Bite was almost tolerable, but the whole piece was a little overwhelming. The company offers Dark and Milk Chocolate versions of these bites, as well as candied jalapeno pepper products without chocolate.